My friend Soklim introduced me to this dish a few years ago. Growing up, my mother made all sorts of cold noodle dishes served with fish sauce but I never had Mee Ka La. Soklim tried to explain it to me, telling me there were noodles, fresh herbs, etc. and I kept asking her, "Are you sure you're not talking about banh hoi? 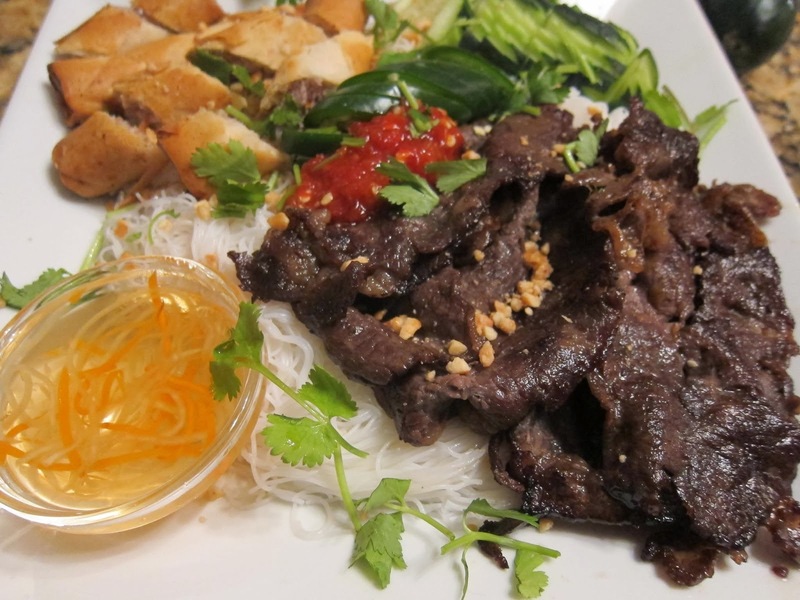 ", another cold noodle dish usually served with meat and fried eggrolls. had prepped the noodles for us. The noodles were not the same as banh hoi and it was topped with hard-boiled eggs. After a bite, I a was a fan of the light noodle dish. I was planning on making fried lo mein for one of my dishes to bring to a Superbowl potluck but I thought I would make something on the lighter side. Then it dawned on me, I can try to make Mee Ka La! This recipe slightly varies and the noodles are different. Wash all the vegetables and herbs and set aside to drain. When the dish is ready to be served, add the garlic tossed noodles to the bowl and layer it with your favorite vegetables and meat/egg toppings. Top of the bowl with a few tablespoons of sweet fish sauce and chili paste for a kick! I love adding extra mint and extra sweet fish sauce! Enjoy!